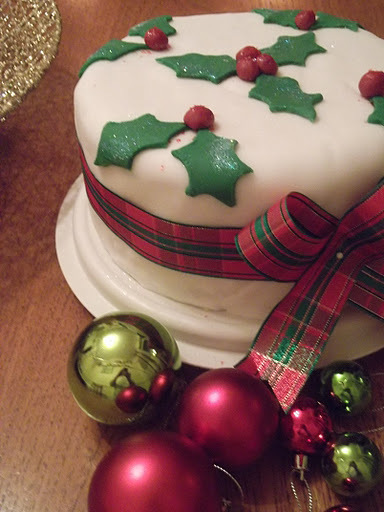 Christmas would not be complete without a Christmas Cake. Fact. Everyone’s Granny has their own recipe, yet more often than not people buy a shop bought cake. Even those members of my family who decorate their own cakes buy the fruitcake from a Supermarket first. Considering my Mum and Dad were famous for their Christmas Cakes before they had children, I couldn’t understand why everyone avoided making their own. If my parents could make one every year without fail…why couldn’t everyone else? So, armed with a near-illegible copy of my parents old Christmas Cake recipe, this year I decided to make my own cake. I was pleasantly surprised with just how easy it is. Though…the proof is in the pudding as they say. I must admit I was a bit nervous serving it to guests – after all when you’ve never made a Christmas Cake before and you don’t know what its consistency, colour, texture etc should be it’s hard to know if the recipe has gone to plan. So, if I can do it, so can you! 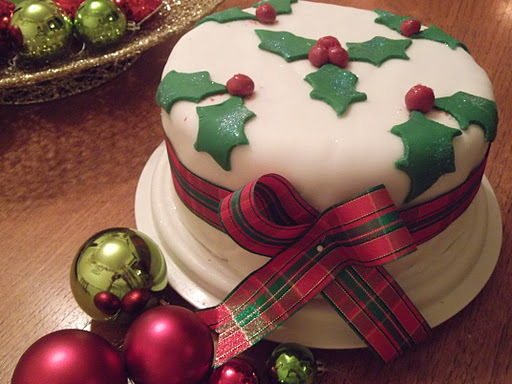 I urge all of you to make your own Christmas Cake this year! I have started my own tradition, so why not start your own too!!! Here is my recipe, I am sure it will not fail you. WARNING: This is highly boozy! (Though Delia assures me you can replace the brandy for orange juice for a more family friendly cake). This traditional Christmas cake has been passed down in my family for generations. It's tried and tested! A day or two before you intend to make the cake, put all of the fruit into a bowl and pour over the brandy. Cover with clingfilm and leave the fruit to re-hydrate. The day you wish to bake your cake, begin by beating the butter and sugar until creamy. Slowly add the eggs to the mixture one at a time ensuring they are fully combined before adding the next one. Next, fold in the flour, chopped almonds, cinnamon and then fruit (with any juices left in the bowl) and treacle. Line a cake tin (roughly 9” x 3 ½”), pour the batter into the lined tin and bake for 6hrs and 20 mins on Gas Mark 1. Leave to cool before removing from the tin. Over the next few days push a skewer into the cake and drizzle a tbsp of brandy over it each day. Roll out the marzipan until it is large enough to cover the whole cake. Mix a spoon of jam with boiling water and brush over the cake. Lay the marzipan over the cake and smooth down. Leave this to dry for a day. The next day, roll the royal icing out until it is large enough to cover the whole cake. Brush the marzipan with hot water. Lay the royal icing over the cake and smooth down. It is now ready to decorate as you wish! Once you’ve made this ENORMOUS cake of course you have to decorate it. It you are using the ready-roll marzipan and icing (which I admit I did) then you will have to roll it out thinner so that it covers the whole of the cake. You may also want to use a cake leveller, or just a very big sharp knife to give the cake a hair cut and ensure you have a flat top. 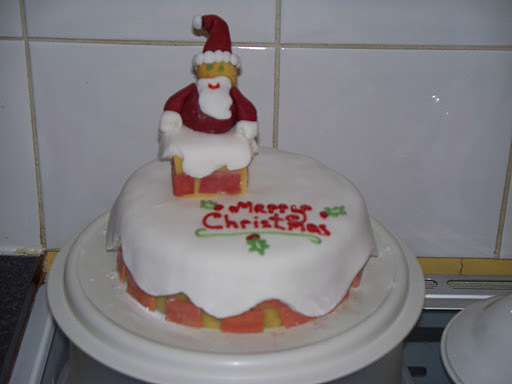 It is then up to you what style of Christmas Cake decoration you go for. Every year my boyfriend decorates his with a variety of plastic figures and handmade snowmen. As you can see I went for the novelty factor! Cutting the bricks out took forever, but I was happy with how it turned out! Overall, preparing the cake took me 5 days. Unfortunately for me I could only do it in the evenings, and with the length of cooking time it involved going to bed then waking up at 1am to take it out of the oven. Of course you can be much more sensible and plan a day in which to cook it! Nonetheless, I will definitely be making my Christmas Cake from scratch again next year! But hopefully I will be able to allow myself a little longer to make it! I’ve submitted this recipe as part of the Red and Green Event over at Simply Food. There’s still a few days to go so get involved! Wow this cake looks amazing, beautifulLy decorated. I would like you to invite you to link it up with let's cook for Christmas red./ green event @ simply.food. I'm envious. I forgot this year!